The spring migration of Monarch Butterflies from their wintering grounds in Mexico begins in early March. Migrating Monarch butterflies appear in new areas just as the milkweed is starting to grow, perfectly timed so that the females have places to lay their eggs. Known as host plants, the female Monarch deposits eggs on milkweed plants, to the exclusion of all other plants, and the caterpillars that emerge feed upon the milkweed, exclusively. 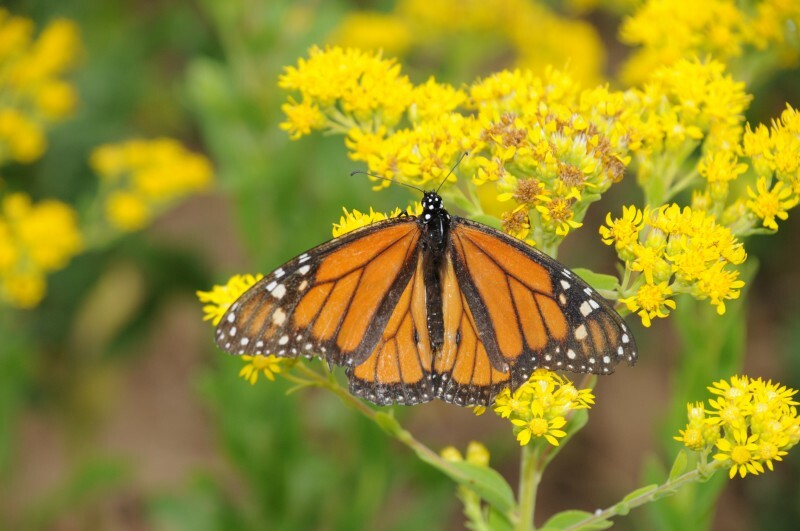 The best habitat for Monarchs includes both: plants for nectar and host plants. Both are necessary for Monarchs to produce successive generations throughout the summer, and to sustain their migrations. Monarchs lay their eggs on milkweed plants, exclusively, and rely on these “Asclepias” plants throughout their summer breeding cycle in North America. But they also need other plants for the nectar. Without nectar from a variety of fall-blooming natives the butterflies would be unable to make their long journey back to their overwintering grounds in Mexico. Make sure to include both host and nectar plants in your plan. LOCATION. A good butterfly spot receives 6 hours or more of full sun a day. Ideally, the location will give shelter from the wind as well. The sunny side of a garage or along a solid fence in the sun offers enough protection. Any well-drained soil is acceptable. For Dry Sandy soil – Butterflyweed, Whorled Milkweed, Showy Milkweed, Common Milkweed. For Loamy soil – Sullivant’s Milkweed, Butterflyweed, Whorled Milkweed, Showy Milkweed, Common Milkweed, Red Milkweed. For Clay Soil – Butterflyweed for Clay, Showy Milkweed, Common Milkweed, Red Milkweed. For Moist Soil – Common Milkweed, Red Milkweed. NECTAR PLANTS. Milkweeds are not the only plants they need. Adult Monarch butterflies seek nectar from a variety of other native plants, as well. The nectar provides energy to the adult butterflies and it fuels their flight. Fall-blooming natives such as asters and goldenrods are very important. The Monarchs need as much fuel as they can get on their long flight back to Mexico, in the Fall. Shop for individual plants from our list of Monarch Favorites. If you’re looking for a few Monarch magnets, all of the natives on this list are highly sought by Monarchs, including both host and nectar plants.